METAL FORMING YOUR COMPLEX PARTS. WE HAVEN’T MET A BEND WE COULDN’T HANDLE. At AccuBurn, Inc., we have the resources for providing cost effective and innovative metal forming solutions for industries including transportation, heavy duty equipment, and defense. 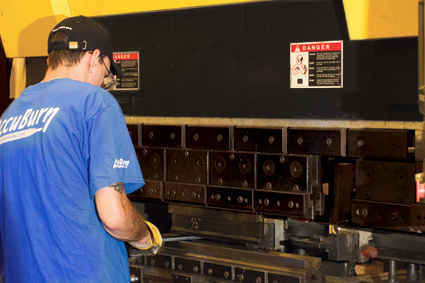 AccuBurn’s CNC forming equipment consists of a 60 ton press brake as well as 175 ton press brake for forming sheet, plate, and solid round rod stock. Electronically driven for reliable control over accuracy and repeatability, our forming equipment features a 4-position CNC back gauge with auto thickness detection to ensure precise angles in every bend. Capable of working with mild steel, stainless steel, and aluminum in various ASTM grades, we have the capacity to form components up to 30 mm in thickness and 6’ in length while achieving dimensional tolerances of ± 0.059″ and angular tolerances of ± 0.25°. Advanced technologies, a skilled workforce, and tight process controls allow us to meet the most challenging specifications. With our years of experience and committed staff, we have a great understanding in the science of metallurgy as it relates to the forming process and offer our guidance and support on every project. We promote a culture of quality and hold ourselves to the highest standards of excellence. Click on Metal Forming Specifications button to see full process specifications. Contact us at any time for more information or a quote. Copyright © 2017 AccuBurn, Inc. All Rights Reserved.